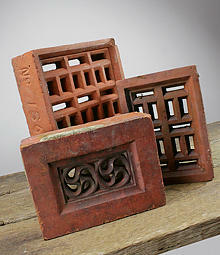 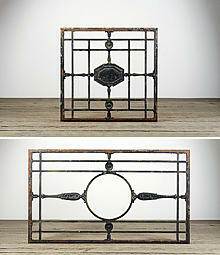 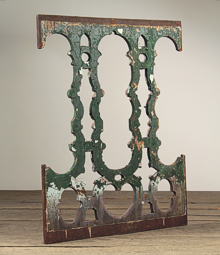 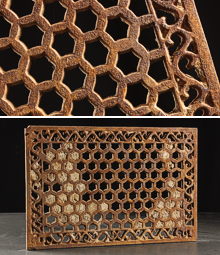 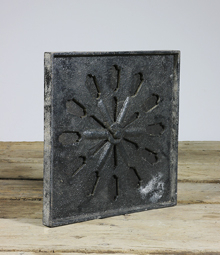 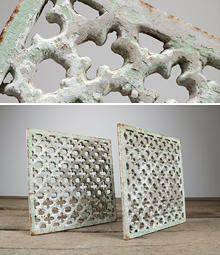 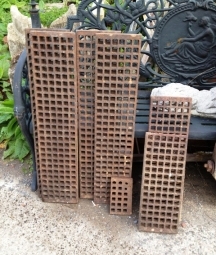 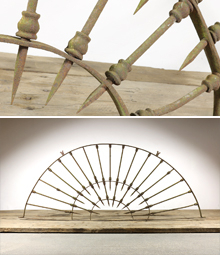 Reclaimed ornate cast iron gratings and grilles- English Salvage. 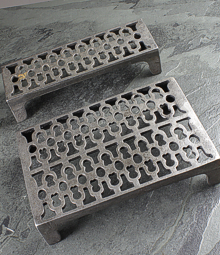 The technique of metal casting came to its peak in the 19th Century. 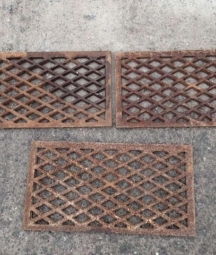 Most of the Victorian ironworks were located in Scotland and the Midlands and they had huge catalogues of cast iron patterns, from grilles to columns. 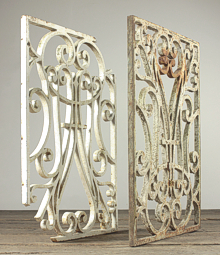 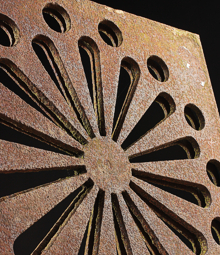 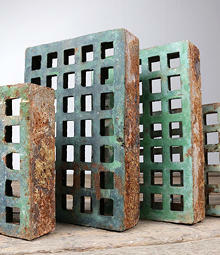 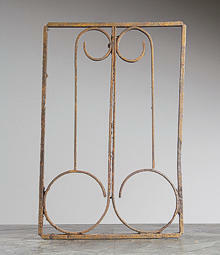 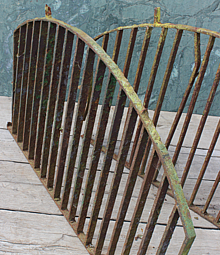 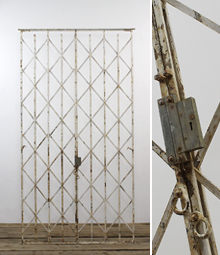 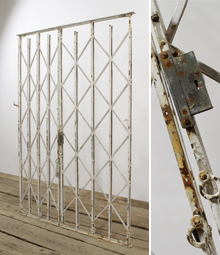 We mostly reclaim decorative iron grilles or gratings from old greenhouses, churches and schools. 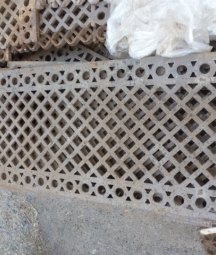 The function of such floor grilles was either to cover heating or water pipes (to convect heat and allow service access) or to allow ventilation. 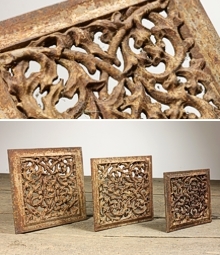 We come across an amazing variety of patterns, from quite basic square or diamond patterns to elaborate floral swirls. 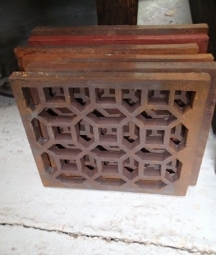 Other sources of old grilles include elaborate cast iron railings, often from chapels and churches, radiator covers/grilles and other patterns of vents or air bricks. 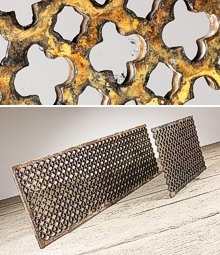 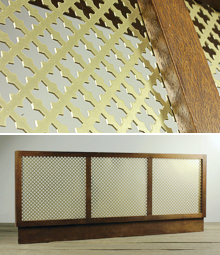 Our clients find so many different uses for these old grilles, from table tops to incorporating them in bars or other shopfittings. 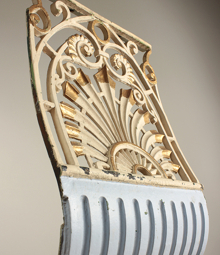 They are often stripped back to bare metal and then lacquered to show off the lovely metallic sheen of cast iron.